Unique Value: Our Yoga Teacher Training integrates the rich spiritual lessons of yoga into your training, your yoga practice, and your life. This is our seventh 200-hour training and the only one planned for Charlotte in 2019. 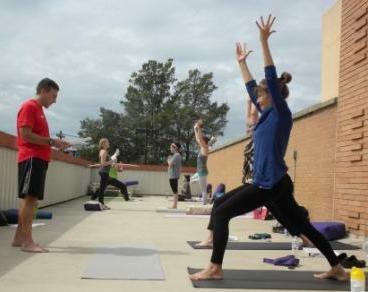 Our graduates are teaching at private yoga studios, 11 YMCA’s, local colleges, and many other venues. Where? Morehead Street area, Charlotte NC Venue to be announced in mid October. Yoga Style: Vinyasa Flow with a Spiritual Yoga Integration. We also cover how to teach an Ashtanga, Yin, power, hot, restorative, and deep stretch yoga class. Learn to flow through life with ease. We will integrate the rich spiritual lessons of yoga into your training, your yoga practice, and your life. *You can use multiple discounts from above when you register for the yoga teacher training. $300 due with application, February 1 $500 due, March 1 $500 due, April 1 $500 due, May 1 balance due. 100% of payment must be received in full prior to graduation and issuance of certificate. Deposit is refunded if not accepted into the training. The training cost includes 9 required training weekends, 1 copy of the GoalYoga Teacher Training Manual (3-ring binder), 1 copy of Yoga Secrets: 52 Life-Changing Secrets, and a graduation certificate. The cost does not include several books, spiral notebooks for notes, or any other items. It is not essential that you desire to teach yoga. Yoga was created as a recipe to help us flow through life with ease. Many students enroll for the life-changing experience. This training is designed for anyone at any level of yoga experience. This Immersion is for those who seek a greater understanding of yoga and want more out of their yoga and out of their life. We will explore the interconnection of the body, mind, and spirit relating to yoga and to your life. It is a delicate balance of a physical, mental and spiritual practice. You should find that these skills are directly transferable to your professional and personal growth. For more information on Yoga Teacher Training.